Android 5.0 Lollipop is still far from a major release on devices other than the Nexus 6 and 9 but the one feature – in addition to loads of others – getting a lot of attention lately is Smart Lock, with the option of adding trusted places. This location based trigger basically tells your device to ease off on the security measures in place for the lock screen on Lollipop. A sweet little addition indeed, and it is limited to Android 5.0 for now. However, this is Android we’re talking about, and you can get the very same feature on any other device which is not even on Lollipop. 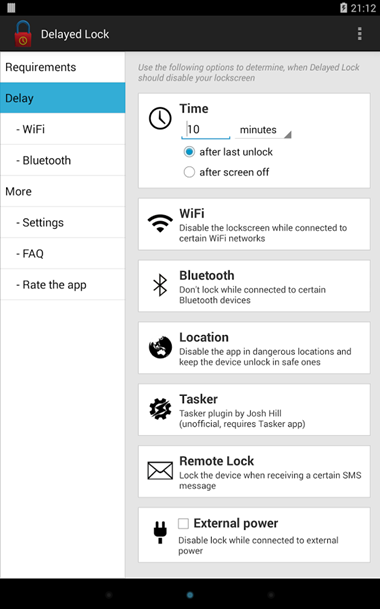 Enter – Delayed Lock, one of the simplest Android apps out there to offer such a functionality, as it allows you to remove the lock screen security measures using your device’s location, Wi-FI, Bluetooth and a Tasker plugin. 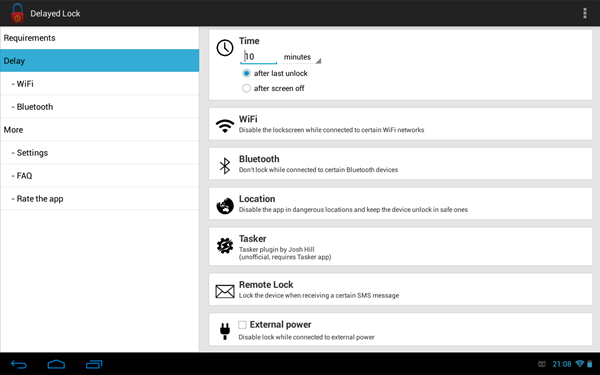 Delayed Lock works on a similar principle to Lollipop’s Smart Lock, where users can certify certain Wi-Fi connections as trusted, thus disabling the lock screen whenever the device is connected to that particular hotspot. 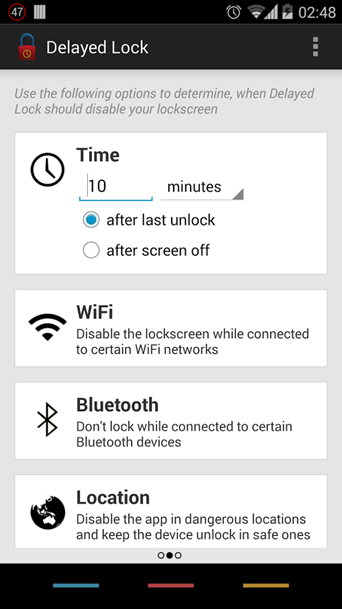 If you want to disable the lock screen at a certain location, then that can be done as well. Users can also set up trusted Bluetooth devices to offer the same purpose of disabling the lock screen. Additional features include the ability to delay the lock screen for a certain period of time, and integration with Android Wear devices if you happen to have one. That said, the app does have a few limitations of its own such as not supporting pattern lock or Face Unlock, though these features are supported if your device is rooted. 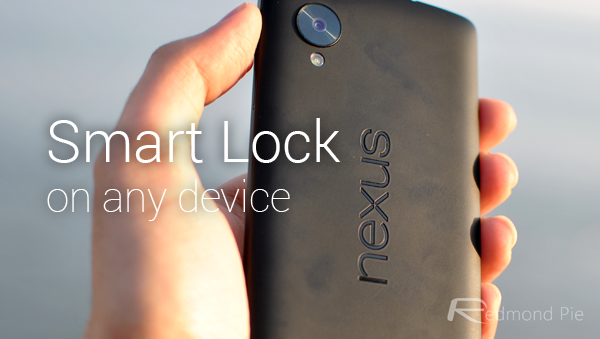 More so, if your device is fully encrypted, root access will be required for Delayed Lock to function. 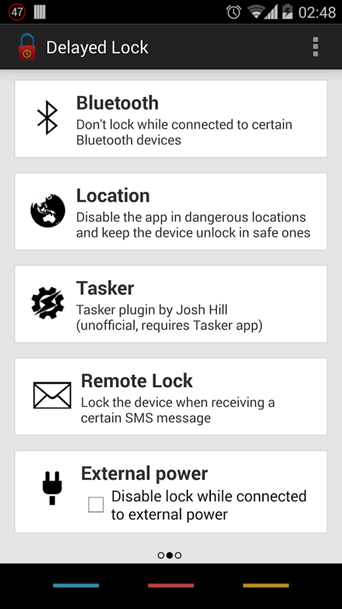 Delayed Lock is definitely not the first app to offer triggers and conditions for disabling the lock screen on Android devices, but is definitely the one that offers a trio of triggers that can be configured by the most novice of users. This is one reason the app comes in at $2.99, but can be downloaded for a 7-day trial period to help you decide. @melsetay:disqus, If you have a jailbroken iOS device, CleverPin is and has been my go to for this feature.